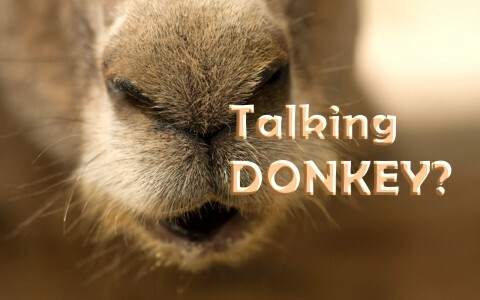 What Is The Story Of The Talking Donkey In The Bible? The Bible has an account of a talking donkey. Why did God cause this and what can we learn from this historical account in the Bible? God speaks to us today and we don’t even see Him, however we have His Word being spoken to us through the pages of the Bible. Paul writes that “All Scripture is breathed out by God and profitable for teaching, for reproof, for correction, and for training in righteousness” (2 Tim 3:16) and this means the Old Testament as well as the New Testament. This gives meaning to Peter’s command that “I want you to recall the words spoken in the past by the holy prophets and the command given by our Lord and Savior through your apostles” (2 Peter 3:2). The Apostle Peter declares the writings of Paul as Scripture too in 2 Peter 3:15-16 “And count the patience of our Lord as salvation, just as our beloved brother Paul also wrote to you according to the wisdom given him, as he does in all his letters when he speaks in them of these matters. There are some things in them that are hard to understand, which the ignorant and unstable twist to their own destruction, as they do the other Scriptures” so we can clearly see that Paul’s writings are counted among what is considered Scripture. That clearly means that the Old and the New Testament are God’s inspired words and is God speaking to us but sometimes, as we will read, God can speak through other means too as even Jesus said to those who were angered by the praise heaped upon Him “if these were silent, the very stones would cry out” (Luke 19:40). Habakkuk wrote about the coming judgment of the Chaldeans that “The stones of the wall will cry out, and the beams of the woodwork will echo it” (Hab 2:11). With God, all things are possible (Matt 19:26b), not so with man (Matt 19:26a). When King Balak, the king of the Moabites, wanted to destroy Israel, he called upon Balaam to call down a curse upon them but every time he tried to call down a curse on Israel (Num 22:6), he ended up blessing them (Num 23:11). King Balak told Balaam “that he whom you bless is blessed, and he whom you curse is cursed” (Num 22:6b) so this is why he sought Balaam to bring down curses upon Israel but Balaam refused, knowing that God forbid him to do so even telling Balaam “You shall not go with them. You shall not curse the people, for they are blessed” (Num 22:12). Balaam finally had God’s permission as he heard God say “If the men have come to call you, rise, go with them; but only do what I tell you.” So Balaam rose in the morning and saddled his donkey and went with the princes of Moab” (Num 22:20b-21) however God was angered and he would experience an encounter that would change his plans (Num 22:22). So at the request of King Balak Balaam went but this didn’t please God at all and in fact angered Him (Num 22:22a) and as he went “the angel of the Lord took his stand in the way as his adversary. Now he was riding on the donkey, and his two servants were with him. And the donkey saw the angel of the Lord standing in the road, with a drawn sword in his hand. And the donkey turned aside out of the road and went into the field” (Num 22:22b-23a) but Balaam didn’t give up that easily though so “Balaam struck the donkey, to turn her into the road” (Num 22:23b). This didn’t work either because “the angel of the Lord stood in a narrow path between the vineyards, with a wall on either side. And when the donkey saw the angel of the Lord, she pushed against the wall and pressed Balaam’s foot against the wall. So he struck her again” (Num 22:24-25). Once more “the angel of the Lord went ahead and stood in a narrow place, where there was no way to turn either to the right or to the left. When the donkey saw the angel of the Lord, she lay down under Balaam. And Balaam’s anger was kindled, and he struck the donkey with his staff” (Num 22:26-27). That was all that the donkey could take from Balaam because it wasn’t the donkey’s fault so “Then the Lord opened the mouth of the donkey, and she said to Balaam, “What have I done to you, that you have struck me these three times?” And Balaam said to the donkey, “Because you have made a fool of me. I wish I had a sword in my hand, for then I would kill you” (Num 22:28-29). What a strange occurrence here. Balaam is so angry that he doesn’t notice that he’s having a conversation with a donkey! Sometimes human anger can be so great that we lose all sense of rationality and logic. Then “the donkey said to Balaam, “Am I not your donkey, on which you have ridden all your life long to this day? Is it my habit to treat you this way?” And he said, “No” (Numb 22:30). Finally “the Lord opened the eyes of Balaam, and he saw the angel of the Lord standing in the way, with his drawn sword in his hand. And he bowed down and fell on his face. And the angel of the Lord said to him, “Why have you struck your donkey these three times? Behold, I have come out to oppose you because your way is perverse before me. The donkey saw me and turned aside before me these three times. If she had not turned aside from me, surely just now I would have killed you and let her live” (Num 22:31-33). Balaam acknowledged that “I have sinned, for I did not know that you stood in the road against me. Now therefore, if it is evil in your sight, I will turn back” (Num 22:35) but “the angel of the Lord said to Balaam, “Go with the men, but speak only the word that I tell you.” So Balaam went on with the princes of Balak” (Num 22:35). Today God still speaks to us but not through donkeys or through stones nor through walls but in His written Word the Bible. You have no need to hear a word from the Lord from someone else because we have the Bible and we have pastors, group leaders, and Bible study and Sunday school teachers but the Word of God is the clearest, most distinct voice of God there is and we should believe that…even if you hear a donkey tell you something else. Okay unless the picture is not relevant I want to inform you that this image is a big dent in your appeal to your audience. That animal pictured is not a donkey but instead a kangaroo. A donkey is in the same family as horses; therefore, they have the same nose as horses. That is no horse nose. Okay. Thank you Joanna. Have a good day. Wow, to be so petty over a picture? BTW, it DIDN’T put any dent in my appeal for the article! Thank you Mr. Wellman for it. Some people have too much time on their hands…. Thank you, this article helped me to go towards a decision that I need to make. Absolutely Love your kangaroo/donkey picture!!! I love conceptual art and i see a prophetic meaning behind it! It certainly made me laugh!!! Bless You! Previous post: What Did Jesus Mean When Talking About “Casting Pearls Before Swine”?